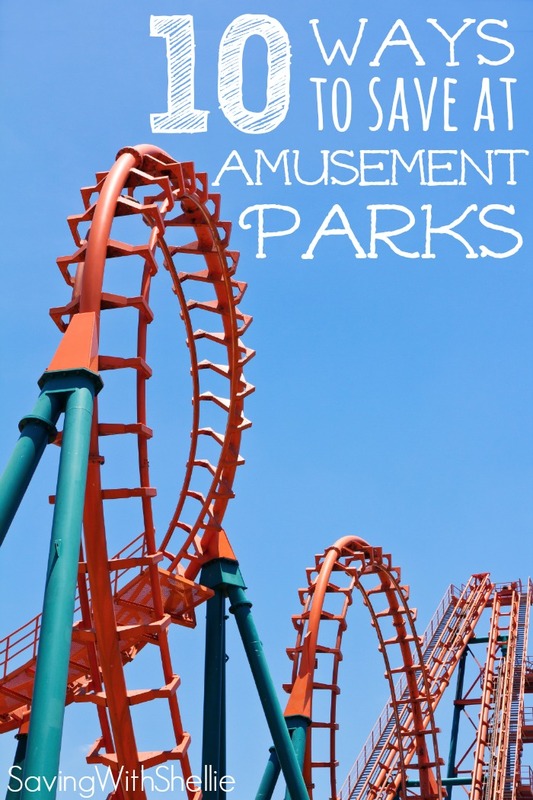 Amusement Parks are popular family destinations. The tickets are expensive and all the extras inside the park add up quickly to make your park visit really pricey. Here are a few ways to keep costs down and enjoy the park without exceeding your budget. 1. Eat before you go – Before you head out to the park have a big breakfast- filling up will keep you and your crew full for at least a couple hours. It also means you can get right to the rides instead of searching for somewhere to eat. 2. Save on Souvenirs – Before you even leave for your trip discuss your budget with the family. Give everyone a designated amount to spend on a take home souvenir- like $20. Whatever is left over at the end of the day is theirs to spend elsewhere. You can often get cute mickey mouse, or other character items outside of the park for much cheaper. 4. Start early, leave early– If you start your day at the park early, not only can you get a jump on the rides before the lines get long and the temps soar, you can be done earlier which means you can eat at home, or on the road at a reasonably priced restaurant instead of shelling out $100 or more for a family dinner. 5. Go in the off season, look for special resident, homeschool, or off days discounts– Do some research and plan ahead. Find out when the parks “off” season is, they usually offer pretty decent discounts to keep attendance up during these times. Residents rates can save you $20 or more off the cost of tickets. 6. Consider a Year Pass – If you are traveling out of state this probably isn’t a great option for you. But if you are visiting a local theme or amusement park and you intend to visit it several times throughout the year this is often the way to go. These often pay themselves off after one or two visits, the rest you can consider free beyond gas and food. 7. Plan and Pack – Check the weather report and pack accordingly. A $7.00 sunscreen at WalMart can cost you $15.00 inside the park. Take your own towels if you are visiting a water park, don’t pay the crazy mark up on merchandise just to have their name on it. Bring your own stroller. The cost of a locker at the park is much more reasonable, when you don’t feel like carrying all the gear you packed than buying it all inside. 8. Cheap hotel – When traveling to a park out of town and you have to stay overnight aim for an inexpensive, clean hotel, without the bells and whistles. There is no need to splurge on a fancy hotel for the waterside, and limbo contest if you are only going to be sleeping there and spending all your other time outside the hotel grounds. Check around for reviews to find a cheap and clean hotel. Also try to find one that includes free breakfast, that is a great deal of savings right there. 10. Bring your own food – Especially with babies, toddlers, or for anyone with special dietary needs. SOME parks offer areas for picnicking and you can bring in your own food and drinks. If not (most don’t) you could also load up a cooler, leave it in the car and come out at lunchtime for a parking lot picnic. Lunch at amusement parks for 4 people can easily ring up to over $60 for something as simple as hamburgers. For more savings advice, frugal tips and recipes, be sure you Follow Me on Pinterest and check on the Best of Saving with Shellie Board! Great list. We had season passes to Six Flags and spent a small fortune on drinks until I found out a secret that they will never share. By law (at least in California) they have to provide water at all of the places where drinks are sold. They will give you a cup of cold water on ice. That may seem obvious, but for some reason people, like myself, don’t realize that amusement parks have to abide by the same laws as with any other restaurant. It’s the same for Carowinds in NC. Often on very hot days they will announce over the intercom that you may receive free waters at various locations through the park. I do have to disagree on #4. We receive season passes to Carowinds every summer, if you arrive after a certain time tickets are half price. With the park staying open till 9 or 10 pm you have plenty of time to ride all the rides with small lines and cooling temps. purchase of a $6.00 wristband. When we do stay the night, we don’t overspend and use my husbands state employee discount to get a cheaper rate. It’s about having fun in the park, not staying in a fancy hotel! As long as it’s clean and has free breakfast it is great for our family of 5. When we went to magic mountain we use to go and after you got in you could buy an extra day for like $1-10 I think (been awhile) it was real cheap but you had to use it within a certain period of time. So if you stay overnight and don’t have season passes you could go back the next day for next to nothing! Don’t know if they still offer them though, I think they were called twickets and you could get in much faster. No waiting in the ticket line. This way you can do half the rides one day and the rest the next. My family has been asking to go to an amusement park for months and I think it could be really fun. I love your tip on going early to help avoid long lines. I’ll have to keep this in mind once I find the best family amusement park in my area.